William enlisted on 11th October 1915. He was 29 years and 11 months old, was a carman by trade, and was living at 36 Redriffe Road, Plaistow, London at the time. 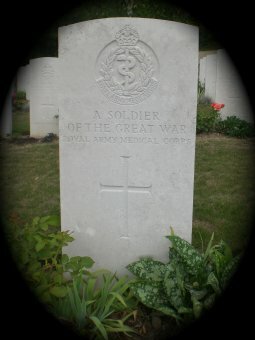 He was posted to "T" Coy on 13th, then was transferred to serve with the 133rd Field Ambulance on the 28th. On 3rd September 1916, during the Battle of the Somme, the 39th Division became involved in the Fighting on the Ancre. The A.D.M.S. wrote �The position occupied by our troops was one from which it was most difficult to evacuate owing to the ground being exposed and the line of evacuation a lengthy one. The entrenchments were dominated on three sides, the Aid Posts small and inadequate and exposed to shell and machine-gun fire. Added to this I am informed by officers commanding bearers and others that enemy snipers were most active, picking off our bearers when collecting, and wounding again the patients being carried on stretchers. Super-added to which were weather conditions which turned the frontal surroundings, roads and pathways into a boggy state.� The R.A.M.C. casualties were 7 O.R�s killed and 5 officers and 76 O.R�s wounded. William was one of the 7 killed. He was the son of William and Mary Barton of 38 Willow Grove, Plaistow; and the husband of Isabel Barton of the same address as above.